Now every Batman fan can have special socks like these Batman utility belt socks that are just fun and so much better than plain colored socks. The Batman socks fit men’s shoe sizes 6 -12 and yes ladies they will look great on you too. 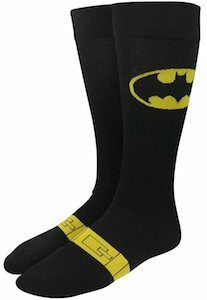 The Batman crew socks are black with on the sides the famous Batman logo and around the foot, you will see the yellow utility belt and you don’t have to worry there are not buckles that hurt as it is just part of the pattern. The Batman socks even work great when you wear a suit as they are not too obviously Batman socks when you wear long pants.